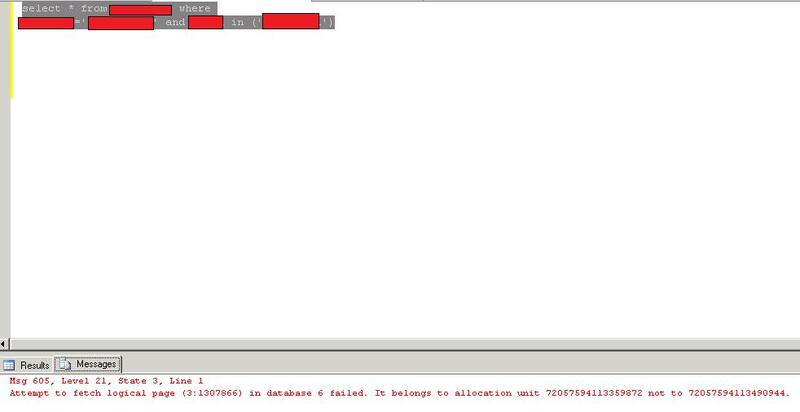 Attempt to fetch logical page (3:1307866) in database 6failed. It belongs to allocation unit 72057594113359872 not to72057594113490944. Warning: Fatal error 605 occurred at OCT 31 2011 6:08AM. Note the error and time, and contact your system administrator. There was a festival holidays in our Indian office from 26thto 28th OCT 2011 (Wed/Friday) so obviously I was out of town andback after 5 days on 31st OCT 2011. As soon as I come to the officeand checked few of my email, I suddenly get complain that few pages in oursoftware are throwing an error so I picked up the query which was there inthose pages along with the same parameter they were providing and found theerror given above. As soon as I read this error, I came to know that there is apage corruption in database. It may bedue to heavy snow fall in NJ in October, they have got power failure there fromfew days and tried to keep the server up and running via power generator. Assoon as Power Generator’s fuel get finished, everything gets down and afterrefuel, they starts everything again. I came to know this as soon as I comeback from holiday. I think this is the Indian New Year gift to me. I tried to gather some more information about the data fileand page number given in error message with DBCC PAGE command. You can use option 0,1,2,3 as the last parameter (bold 3) ofDBCC PAGE command. So now I have two options. I HIGHLY RECOMMEND to go for 1st option but ifyou are out of luck and don’t have last full backup, you must have to go forsecond way. I have restored page from my last full database backup withbelow given TSQL. Now, let us talk about second option if you don’t have fullbackup of your database. Use DBCC CHECKDB command. –it will onlyshows error messages and warnings. Once you execute above command, it will recommend you repairlevel. it may recommend REPAIR_REBUILD if you really lucky but if you will seerepair level REPAIR_ALLOW_DATA_LOSS, you have to be ready to lose some of yourdata. You may use either of the below given command based on theRepair Level you have been suggested. Moral of the story is, always have FULL recovery model foryour database and schedule full/ transaction/ differential backup policy. Thisis a MUST DO for any DBAs. You never know, when will you need it!!!! My previous article was on Compilation& Recompilation of Stored Procedure. After reading that article, two ofmy reader sent me an email about more clarification on some terminology and thatis the base of writing this article. Actually SQL Server Query Optimizer is really one of thesmart tools which used to find or generate best execution plan for query or storedprocedure and make the task easy for DBA. Basically it uses Cost BasedOptimizer (CBO) to do this task, even sometime feels to have specific ExecutionPlan for query so Microsoft have provided many different hints at differentlevel. Query Optimizer (QO) used to save execution plan when itcompiles Stored Procedure first time and use the same execution plan when thesame stored procedure is being used again so that you can get rid of overheadof generating execution plan again and again. 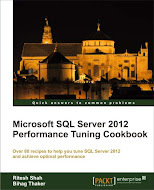 When index statistics changes heavily, QO used to recompilethe statement to get best plan for your stored procedure but if you are surethat the existing Plan would works fine than one should go for OPTION KEEPFIXEDPLAN for that statement so that you can save your resources and boost upperformance. 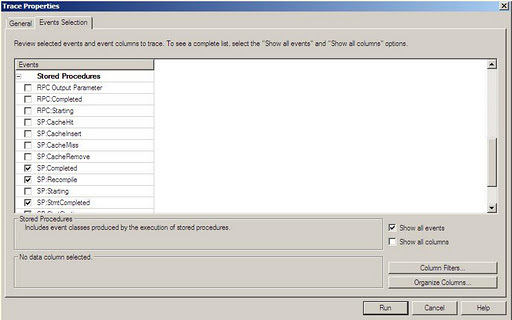 I will demonstrate this with few queries run in SQL ServerManagement Studio (SSMS) and capture the results in Profiler. I will select following Events in Profiler while creatingnew Trace for my server. Now execute following TSQL in your SSMS. Now, make change in Index statistics by inserting so manyrecords in table so that we can test the effect in profiler after executing SPagain. 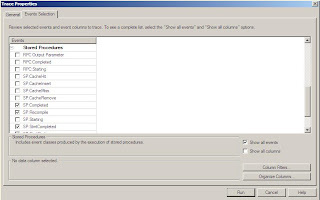 Now, if you see the profiler, you will see “SP:Recompile”event as your statistics are updated so it need recompilation of statement. If youagain few more thousands record in same table and execute the same SP again,you will see recompilation again. Now, after droping table and SP, we will make one smallchange in Stored Procedure and will use “KEEPFIXED PLAN” hint so that we canavoid recompilation. After recreating table along with fresh records, we aregoing to see what happened while executing SP in above statement. Since our table now has only 1 record so it is time tochange statistics with bulk insert as follows again. Here is the screen capture of Profiler which doesn’t showRecompilation. You can even add few more thousands of rows and execute SPagain, you won’t get recompilation.